Welcome to Bowlero—Gilbert’s coolest place to bowl, dine, party, and play. Hit the lanes and let the good times roll at the area’s most entertaining venue for date night, family night, birthdays for the kids (or yourself), and corporate parties that rock the cubicle. Conveniently located at 1160 South Gilbert Road (across from Gilbert Town Square), Bowlero is Maricopa County’s premier party and entertainment destination. 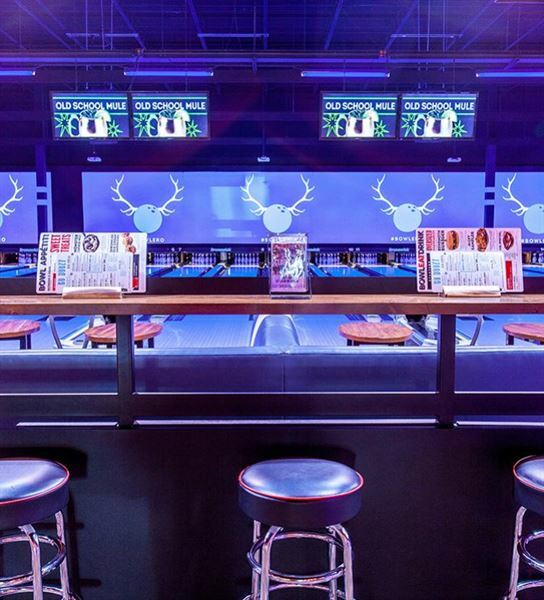 Join the fun and feel the excitement with blacklight bowling on over 40 lanes featuring plush lounge seats, hi-def video walls, and the kind of stellar service that delivers our nationally recognized menu items directly to your lane—while you play. At Bowlero Gilbert, bowling is just the beginning. Get behind the wheel and enjoy all the crash-worthy fun of our bumper cars. Suit up and experience the thrill of our multi-level laser tag arena. Hit up our massive arcade and have a ball with 70 interactive games, including World’s Largest Pac-Man, NBA Hoops basketball, billiards, air hockey, and other old-school favorites. Or roll into our retro-inspired bar & lounge and enjoy an impressive selection of beer, wine, and signature cocktails. When you’re looking for Arizona’s coolest venue for birthdays, kids parties, holiday parties, and unforgettable corporate events, look no further than Bowlero Gilbert. Our talented party professionals are special event ninjas trained in the art of awesome celebrations. They do all the work while you have all the fun—that way, you can enjoy all the party perks and none of the party buzzkills (like cleanup). They’ll also guide you through our inventive menu of oversized shareables—epic eats and signature drinks that turn every big event into a really big deal—like our five-pound Behemoth Burger, our XXL Pretzel, and the Dunk Tank, a huge fishbowl cocktail that’s meant to be shared. It’s time to BE BOWLED. It's time to Go Bowlero. Visit Bowlero Gilbert today and discover the area’s coolest place for parties and casual fun. Join the Bowlero Clubhouse now and get inside access to special deals, the latest news, exclusive extras, and more.